Sound Works (5 m Not a Single Doubt – Abu Zayan, by Mark of Esteem) became the third winner this week for Ballymore Stables. In great touch through three starts in this campaign, Sound Works ran the fastest last 600m (33.6) for fourth in the Rating 65 1400 metres on 16 December at Te Rapa, and denied by a nose here (Tauranga) on 2 January in the Rating 65 1300 metres. “She was very close here last start, going down by a whisker, and she deserved it,” said co-trainer Pam Gerard. Ideally drawn (4) in the $22,500 Rating 65 1400 metres, sponsored by Lee Amodeo (Maurice Trapp Group), Sound Works secured a prime position in fifth and came around only one horse in the straight to win handsomely. Interestingly, Jake Bayliss had also ridden her to win in Australia – at Bendigo. “Mike (Moroney) sent her over here to get some cut in the ground, so good for Mike. He races a lot here in New Zealand, that he owns himself, to support the stable,” Gerard said. Sound Works paid $4.80 & $2.00 on the NZ TAB tote, running the 1400 metres in 1:24.3, and appears a mare capable of further victories. Gerard had trained Ruby Armani (Makfi) to win last Sunday at Ellerslie, Wonder Woman (Showcasing) on Wednesday at Rotorua, and following the win by Sound Works the stable is hoping for a continuation of good form from Savile Row (Makfi) and Za Za Gabor (O’Reilly) in the $200,000 Thorndon Mile (Gr. 1, 1600m) and $70,000 Desert Gold Stakes (Gr. 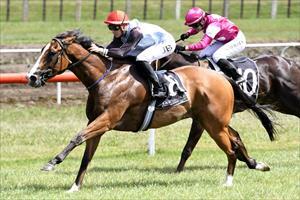 3, 1600m) on Saturday at Trentham. Sound Works was strapped by Scott Magee.